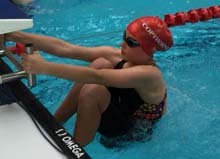 It was a long, hot but entirely worthwhile day at the IAPS National Swimming Finals on Saturday. From an initial entry back in February of approximately 230 schools equating to approximately 2500 swimmers we were very pleased to have three qualifiers Alice R. (U13 Backstroke), Josie M. (U12 Backstroke) and Luca P. (U11 Freestyle). For each event there w ere 16 qualifiers, split into two heats and then a final to decide the National Champion. 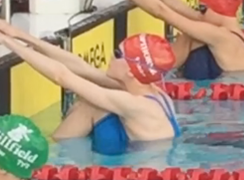 Josie had a tough job having qualified 17th in her event but she put in a spirited swim eventually finishing 10th overall. A superb improvement on her starting position and a great experience at her first National Finals. Alice had qualified 4th for her even t in the earlier heats but had high hopes of improving this as her original heat time was achieved following a day of scholarship sports assessments. After another outstanding performance in the first race, she was 2nd going into the final knowing once again that first place was out of reach barring a DQ for Polly P. from Millfield who’s time was again several seconds quicker than everyone else in the race. Alice was targeting 2nd, the same result that she achieved last year, but in an exceptionally close finish she was just beaten into 3rd place by 2/100ths of a second. Whilst she was disappointed, 3rd in a National Final should not be dismissed, it is a fine achievement. Luca had also been disappointed with his qualifying time earlier in the year which placed him 4th and was some way off his ‘pb’. However, he saved the best for the day of the finals and after two very close heats he was just in the lead going into the final race. 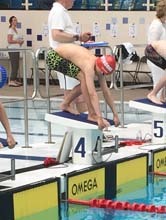 This year he held his nerve, maintained his winning position over the 50 metres and finished ‘National Champion’ in the Boys U11 50m Freestyle. Another amazing performance and just reward for all of his hard work in the pool. Very well done Luca.